On dry days remove winter debris from lawn and garden beds. Check for broken branches (prune immediately) or plants damaged by snow loads or rodents. Remove burlap screens erected to protect plants from wind or road salt spray. Consider a soil test of your entire yard or specific garden areas if you have not had one before. Consult the results of the test before adding amendments to your soil. Soil temperature must be 50 degrees for a proper reading. Tests can also be performed in the fall. Contact Plant Information at the Chicago Botanic Garden at (847) 835-0972 for a complete listing of soil-testing agencies. To avoid compacting garden soil, wait until it has dried out before tilling, planting, or even walking in the garden beds. Mix in 6 inches or more of compost or leaf mold to lighten heavy soil. Watch weather conditions for an appropriate window of time to spray fruit trees or large deciduous trees with dormant oil. Spray if aphids, scale, or mites were a problem in the past. Temperatures must be at least 40 degrees Fahrenheit with no chance of freezing or rain within the following 24 hours. Avoid spraying on a windy day. Certain trees have a phototoxicity to dormant oil and should not be sprayed. A few common ones are arborvitae, beech, red maple, Japanese maple, sugar maple smokebush, blue spruce, blue cultivars of juniper, and yew. Call Plant Information if in doubt. To reduce the spread of oak wilt, all oak pruning should be completed in March, or before the oaks begin active growth. Pruning should not resume until after the first frost, or around November 1. Prune fruit trees in early March on a dry day before buds swell. As with all pruning chores, sterilize pruning tools with a 10 percent solution of bleach before each cut. Prune out sucker growth, water sprouts, and any diseased or dead branches. Remove crossing branches, rubbing branches, or those that grow toward the center or the plant rather than outward, away from the interior. Fruit trees benefit from having their canopies opened up to permit more sunlight and air into their centers. Prune spring-flowering trees and shrubs immediately after they flower to preserve this season’s flower display. Prune roses when the forsythia begins to bloom. When pruning roses, make a 45-degree cut above a healthy bud, angled away from the center of the plant. 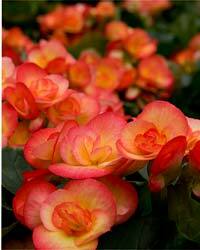 If not done last fall, prune hybrid tea roses and grandiflora roses back to 12 inches to reinvigorate growth. Prune out dried, darkened, and broken canes and any dead tips. Prune shrub roses to remove dead wood and very lightly to shape to size. Fertilize woody plants four to six weeks before they begin new growth only if they have shown signs that they could use it. These would include poor leaf color, failure to completely fruit or flower, or stunted growth. Use a slow-release granular fertilizer or an organic product and water in well. Do not fertilize newly planted trees or shrubs. Wait one year before making this application. 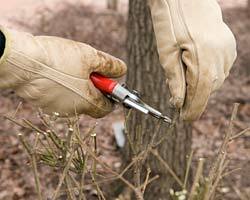 Plant trees and shrubs before they break bud and when soil conditions permit. If spring weather is unusually wet, consider planting in the fall when the plants begin their dormancy. With all woody plants, avoid planting too deep. Research indicates that more trees suffer from being planted too deep in the hole than any other problem. Plant with one-third of the root ball above ground. Taper soil away from the trunk back to ground level. Mulch the entire root zone with several inches of shredded or chipped bark. 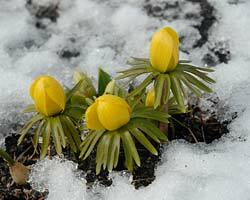 Look for early spring-blooming bulbs (sometimes beneath the snow or ground cover). If necessary, divide clumps of old, nonblooming bulbs or fertilize with a 5-10-5 granular fertilizer now and again in fall. Mark the spots with small stakes for locating next fall. Gently press back any perennials that heaved out of the ground over the winter. Mulch those plants with several inches of shredded material. As days warm up, gradually pull back mulch from around perennial crowns. Remove dead leaves from perennial clumps taking care not to injure emerging new leaves. Cut back to the ground all perennials and ornamental grasses that were left standing for winter interest. Prune back to 12 inches stems of autumn-flowering clematis vines. Continue to care for indoor flowering gift plants. Azaleas require even moisture and bright light. Deadhead to keep plants blooming for four to six weeks. Azaleas can go outside to a partly shaded location after May 15, but must come back in before fall frost. Primrose plants can be discarded after flowering or planted directly in shaded, well-drained garden area. They will go dormant during summer months and require heavy mulch to protect from summer heat and winter cold. Indoor-blooming tulip, daffodil, hyacinth, or crocus plants can be planted outside and treated like outdoor bulbs after they have flowered but there is no guarantee they will flower the following year. Get a head start on summer-blooming bulbs and tubers by starting them indoors in moist, soilless mix. Plant Caladium (caladium), Colocassia (elephant ears), Begonia x tuberhybrida (tuberous begonia), Crocosmia (montbretia), Agapanthus (Lily of the Nile), Canna x generalis (garden canna), Polianthes (tuberose), Acidanthera (peacock orchid). Keep warm until new growth appears. Move pots into a sunny window or under grow lights if necessary. Move these pots outside when all danger of frost has passed, after gradually introducing plants to warm weather conditions. Repot houseplants, including orchids, after they have flowered and if they have become rootbound. Increase pot size by one inch. Change the potting soil/fir bark but do not change the level at which the plant was situated in the pot. Fertilize houseplants as they begin new growth. Try low dosages of organic fertilizers or a very dilute, balanced granular fertilizer rather than stronger formulas. Telltale white salt markings on terra cotta pots indicate overuse of fertilizer. Flush out soil of overfertilized plants with plain water. Propagate houseplants. 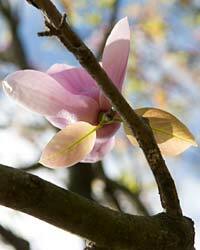 Softwood cuttings, leaf cuttings, air-layering, cane cuttings, or division may all be done this spring. Start seeds of warm-season annuals and vegetables in a moist, soilless seed mix. These seeds are started six to eight weeks before the spring frost date of May 15. Transplant tiny seedlings into a "growing on" mix in slightly larger containers when they have two sets of true leaves. Gradually introduce small plants to outdoor conditions. They can be planted in containers or garden beds after May 15.